How does life go on in the aftermath of tragedy? If it were possible for two lovers to deserve peace, Owen and Della Davis should have been the happiest couple in Utah. But after the shocking deaths of two hundred friends and miners and the dispersal of their widows and children, happiness is hard to come by. Owen has promised Della he is through with mining forever, but he still has to earn a living, and his heart is drawn back to the mines. Meanwhile, Della is wishing for a baby, but her arms remain empty. As she struggles to hold together the pieces of her life—through the resurfacing haunting memories of her father’s death and the heartache of missing a mother she never knew—she wonders if she even wants to reconcile herself to relatives who did her so much harm. Together, Owen and Della must face the secrets of her past as they struggle to build their future. 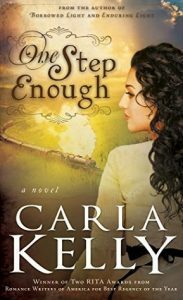 Based on the true events following the Scofield mine disaster in 1900, One Step Enough is a riveting and heartfelt romance filled with suspense, tragedy, and hard-earned love. I was so excited to see One Step Enough, the sequel to My Loving Vigil Keeping! I love the way Carla Kelly writes her historical romances. The characters and situations seem to stay with you for a long time. I still find myself thinking about Della and Owen and wonder what happened to them. And not only to them, to all the other people who really lived in the canyon and dealt with the disaster. One Step Enough starts right after My Loving Vigil Keeping ends. The reader can sense the turmoil in Della and Owen. And also all the people around them as they deal with the aftermath of the mine disaster. Something that kept coming to me about this one was that this really happened. To real people, not just the fictitious Della and Owen. It’s hard for me to imagine the feelings and emotions these real people would have felt as they dealt with everything. I loved the way the author kept the tension and emotions high at the beginning of the book. Della is one of my very favorite characters ever. She’s courageous, strong and wise. She’s the perfect female lead. I loved the way she worked hard to comfort Owen as he goes through his hard time. And the way she cares for Owen’s daughter, Angharad, made my heart melt. Della sees her as her own child, not a step-child. Part of that is probably because of the way she was not taken care of by her uncle’s family growing up. There are hard things in store for her. Owen’s breaking of his promise to her to stay out of the mines is just one of many. But Della rises above it and struggles to not let it push her and Owen apart. Owen goes through his own hard times. Many of his friends and co-workers died in the blast. He only barely escaped with his life. He deals not only with grief, but with survivors guilt as well. I loved the way he had courage to break his promise for a little while to help other miners the way he would have wanted to help his friends. There are so many great characters in this one. One thing that’s fun about that is that many of them were people who actually lived. I enjoyed reading the end notes about the real people Carla Kelly included in this one. I loved the plot. The way that both Della and Angharad work to bring Owen out of his grief was inspiring. This is one of those books that give people hope. Hope that things can and will get better. Hope for a happy life after disaster. And hope is definitely needed by the world in general today. If historical fiction is something you love, make sure to grab this book. But be sure to read My Loving Vigil Keeping first. This one won’t make sense otherwise. I was sent an e-copy of One Step Enough as a gift from the publisher. All opinions are my own.